Does Your Food Love You As Much As You Love It? There is something that’s been eating away at me for a couple of weeks that I finally decided I needed to write about. One of the things that you come to realize as a WLS patient is that head hunger is a very, very real thing and that it is something you have to fight Every. Single. Day. Folks who have never had food issues don’t understand this. My head hunger is something I’ve been fighting with over the past few weeks. And right now, I think I’m winning. Let me explain. When I decided to write a blog about my experiences as a WLS patient, I decided to keep things real, honest, and authentic, meaning that I would write about the good, the bad, and the downright ugly about this whole process. You’ve seen the good–progress reports, progress pictures, major NSVs, all that stuff. You’ve seen the bad–the recovery from surgery, the descriptions of the ugly belly I had immediately post-op. Now it’s time for the ugly. This is the fleshy underbelly of WLS that isn’t always talked about because each person’s experience with it is different. So I’m going to tell you what my experience with this has been so far, because I think it’s important for people to know just how much of this process is changing cognitive and metacognitive behaviors–it’s not all about diet and exercise. Changing how you think about food, and how you think you think about food are critically important to success in this weight loss game. I never really gave it too much thought until I was encouraged to go to the weekly group I go to now. Now, my behaviors are in the forefront of my mind–sometimes so much so that it’s maddening to think about how much I really do think about eating. But I think about it in a different way now, and my thought patterns are still changing and evolving as I get further and further along in this process. For the past couple of weeks, I have had a nagging hunger for enchiladas. Gooey, warm, beef enchiladas covered in chile con carne and topped with cheese. The hunger for them has been so great at times that I can smell the #2C beef enchilada plate from my favorite place in Dallas to get them. I can see the plate in my head, and I can taste the damn enchiladas in my mouth. I love enchiladas, but do they love me as much as I love me? Does my food love me as much as I love it? How will eating enchiladas help me meet my nutritional goals for the day? How will eating the enchiladas help me get to my weight loss goal? How will eating the enchiladas help me stay in my smaller clothes? How will eating the enchiladas make me feel physically if I eat them (especially since it has been over 6 months since I had them)? How will eating the enchiladas make me feel emotionally? Once I sat and thought about the answers to those questions, the enchiladas didn’t sound so good anymore. Now does this mean that I will never eat enchiladas again? Absolutely not! It just means that right now, while I am in the weight loss period of my post-op life, they are not a good choice. They will not help me meet my goal of getting to 170 pounds, which my doctor has already said is a reachable and reasonable goal. I love (insert questionable food here), but does it love me as much as I love me? has actually helped me to avoid a lot of holiday eating that I would have otherwise done. I won’t lie–I have a box of Millionaires a student gave me as a gift for writing a letter of recommendation, and a bag of Godiva truffles another student gave me as a Christmas gift. Both are still sitting in my school bag unopened and untouched because every time I think about busting into either of them, I ask myself those big questions above. I’m starting to ask myself those two questions any time I think I want something that may not benefit me right now by eating it. Another way to look at it is this: food isn’t capable of love. I am. You are. Why spend energy loving something that doesn’t love you right back? Food is something to fuel my daily activity, not something to fill an emotional need I may have. It should never be used to fill an emotional need or void, but we do it all the time. For some of us, this use of food as a calming agent or something to self-soothe with is one of the things that led us to be obese in the first place. So then the question becomes, why do we feel the need to self-soothe using food, and why do we not use something healthy in its place? This is something I need to work on for myself, because identifying the hunger I really have is the tough part. I recognize that I am not physically hungry for the thing I want, but I don’t know why I want to eat the thing that might not benefit me. This is where I’m lacking in metacognitive skills with regard to this head hunger problem, and I’m hoping that by working through the Beck Diet Solution workbook (which I started working in today), and by getting stuff out in therapy I can figure out why I think this way. That was a lot of really heady stuff, I know. But I think it’s important to consider. So here’s some other stuff that’s not quite so heady but that’s worth celebrating: I had my second of two doctor’s appointments today. Today’s appointment was with my PCP. I’d had labs drawn earlier in the week and today we went over the results, and today was the day I’d find out if I could go off my blood pressure medication. My fenofibrate dose is now too high. So that got changed to a lower dose. Rapid weight loss, as this is a very common side effect of bariatric surgery. The fact that I was fighting illness at the time my labs were drawn. Her concern is that I could be developing gallstones, which is a common side effect of rapid weight loss whether it is by bariatric surgery or other means. She did ask if I’d had any abdominal pain or nausea–I’ve had neither. Our conversation this morning helped me to understand why Dr. Carlton asked me the same question yesterday–both of them are trying to rule out the possibility that I have developed gallstones. I’m to go back next month to repeat the test to see if the enzyme levels come down. I hope this is just a transient blip in my bloodwork and that things return to normal next month, but until I do the labs again, I won’t know. I was given the okay to stop taking my blood pressure medication. She wants to re-evaluate in 6 months. But for now, no more BP meds! My fenofibrate dose has been cut to the lowest dose. I take this medication for elevated triglycerides due to family history of heart disease. Thanks, genetics! but was unsuccessful. I stepped up onto it but couldn’t get the pedals moving, and I thought, “Okay, if the skinny minnies can do this, why can’t I?” Total fail. When I got home and had eaten supper, I found a Youtube video that showed me how to use it, so I think I will try again on Sunday. 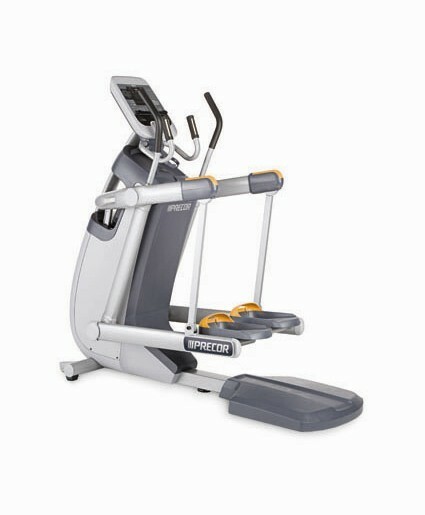 I am not going to let a stupid piece of exercise equipment defeat my efforts to get into a shape that is not round! I also peeked in on a Zumba class that was going on and it looked like fun. I think next Friday night I will give it a try. I am not terribly coordinated but I suppose I can fake it ’til I make it. Right? Today’s food was pretty good. I ate more than my usual carbs because I knew I was going to go to the gym and workout (nice 40 minutes of cardio, go me!). I got in 82 grams of protein, 50 grams of carbs, and 44 grams of fat. I’ve bumped up my vitamin regimen this week to help fend off this cold I’ve been saddled with since Monday, hence the extra C, D and B12 (normally I only take B12 2x a week) each day this week. 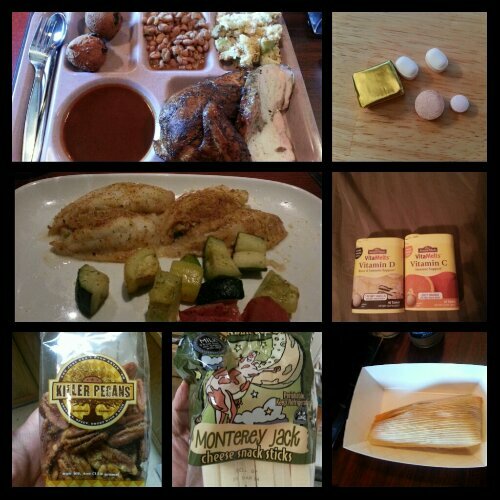 Today’s food choices, from upper right: multivitamin and calcium supplements x2, B12 and iron supplements; vitamin C and D supplements; part of a brisket tamale; Trader Joe’s Monterey jack cheese stick; Killer Pecans; smoked pork loin, Brussels sprouts and cauliflower gratin, pinto beans and half a hushpuppy (I ate part of the smoked chicken breast for dinner); leftover seafood stuffed flounder and green beans (not shown). Also not shown: 2 cups of 479 brand popcorn. This entry was posted in challenges, choices, daily bites, eating, head trips, la guerra, NSV's, oh behave!, post-op, reflections, success, the sleeve, vsg, weight loss surgery, what's up doc? and tagged achievement unlocked!, being authentic, being real, challenges, choices, cognitive strategies, daily bites, eating, exercise, head hunger, head trips, I work out, keepin' it real, la guerra, love thyself, medications after VSG, NSVs, oh behave!, post-op eating, post-op life, VSG, vsg realness, what's up doc?, WLS, work that head game, workin' on my fitness. Bookmark the permalink. Thank you so much for posting this. Your philosophy is something that I’ll keep turning to in the days, weeks, and months to come. I start my 2 week preop diet tomorrow (liquids only) and I am terrified. After midnight tonight, I’ll be beginning my divorce from binging and compulsive overeating. It will probably be the hardest thing I’ve ever had to do in my life. Still, I have no intention of cheating, as I don’t want my surgeon to open me up in the OR and send me back unsleeved because my liver was too big. It was something I’d been thinking about for a good while and I had to get it written down so I’d remember it. You will be fine on the pre-op diet–that is the hardest part of this whole thing, I think. At least it was for me. Sometimes I think the pre-op diet is more mental preparation than physical preparation! I am excited about coming off my BP medication. It’s the one I’ve wanted to come off for a long time now because it’s the one I have taken for the longest amount of time. I’m so glad to be down to one pill a day now (my fenofibrate), but hoping I get to come off of that one too.